What are the qualities of a good roofing contractor? While their credibility and quality of work matters, their mastery of different services reflects their desire to continuously grow as a company. This is an important aspect, especially in the ever-changing construction industry. 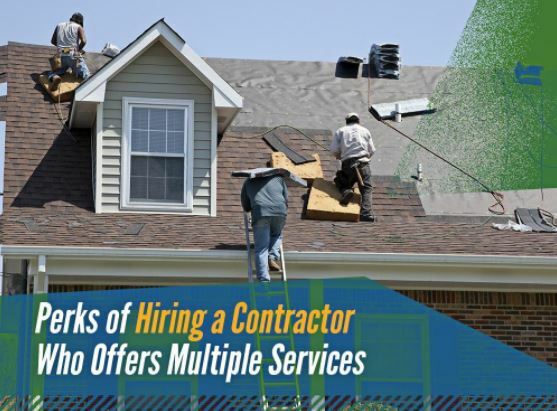 Rogers Roofing, the premier roofing company, discusses the benefits of working with a contractor offering multiple services. A contractor who can handle various projects can easily adapt to your needs. For instance, roof replacement demands installers who specialize in this field. What if you want to install new siding at the same time? You want to entrust your upcoming home improvement project to the pros who can do both tasks. Most contractors who offer a wide range of services have most likely expanded over time. Some probably started as a roofing company and have since branched out. Their years of experience in the field prove their worth in the community. You can expect professional installation of various products like windows, siding, roofing and other items. You can rely on this type of contractor on many construction endeavors. They will have the right tools and equipment to ensure the success of your home improvement project. You can count on their expertise and familiarity with building codes and other local requirements. They will guide you through the whole process and answer any questions you might have. At Rogers Roofing, we provide excellent roofing, siding and window installation services to meet your needs. Our team has been serving homes since 1968, so rest assured that we’ll get the job done right and on time. We’ll also help you pick the right products to match your home’s architectural design. Call us today at (219) 228-8210 for Indiana and (773) 492-2270 for Illinois. We serve residents of Tinley Park, IL, and other nearby locations, including Munster and Dyer, IN.